These breaks offer outstanding value for money and are the nearest you'll find to all-inclusive package holidays in the UK. If you're travelling alone you can enjoy a plethora of low cost breaks with Shearings. You'll also have the chance to meet an array of different potential travel companions with the coach holidays and tours around the UK and Europe. Get booked in early for this year's Christmas Market trips. 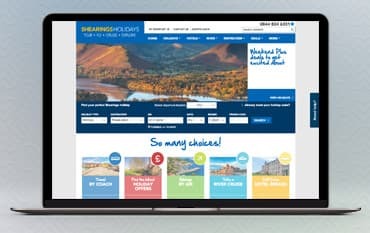 Ensure you never miss out on the latest offers, deals and sales that Shearings has to offer by signing up to the newsletter. Where do I use my Shearings Holidays voucher code? Click on an offer, copy the code and click through to the Shearing Holidays website. On the Shearings homepage, enter your destination, select a departure location, your preferred dates & duration. Select a Holiday location and click through for more details. Scroll down and enter your promo code before clicking ‘Search Holidays’. "Sign up to Shearings Holidays Newsletter and you’ll get the latest destination updates and promotional offers." Shearings Holidays are a Wigan based firm dedicated to providing their customers with fantastic holidays that they deserve and can afford. Shearings Holidays offer coach, air, rail, cruise and hotel breaks to over 170 destinations in the UK, Europe and Worldwide, they also own 52 hotels in the UK which they proudly guarantee will give you the authentic Shearings experience from start to finish. Shearings provide even lower costing holidays through their sale and special offers section, going the extra length to provide their customer's, even more, savings on holidays that they will love. As Europe's largest coach tour holiday operator, they also offer a huge variety of choice - making your holiday as personal to you as possible. A well as coaches Shearings own 44 hotels in the UK, assuring you an authentic experience from start to finish. With Shearings Holidays you can expect friendly and helpful service, great entertainment, comfortable accommodation and great value for money. Explore the superb range of last minute deals today at Shearing Holidays, where you will find Shearing's Bay hotels and coast country hotels in most of Britain's best resorts situated in the best positions! Whether you're seeking to relax and unwind surrounded by natural beauty or in search for a riveting stay in a traditional seaside town you will find a hotel to suit you. Alternatively, take a visit to one of the Shearing's Holidays 'Partner Hotels' where each property is carefully chosen by experts and promises to provide equally superb service, comfortable accommodation and warm welcome, whatever the weather! Discover the beautiful sights of Europe with Shearings Holidays. Your coach holiday can take you to amazing places around some of the most sort after cities in the world such as Italy, Spain, Switzerland, Germany, Austria, France and Croatia, just to name a few. Stay in hand-picked hotels, follow expertly planned itinerary's and enjoy unbeatable value with Shearings as you travel across Europe easily and hassle-free. Discover breathtaking sights and attractions and fall in love with the cool and welcoming atmosphere of Europe. With so much to do and see, Scotland is the ultimate UK getaway that’s not too far from home. From the cosmopolitan cities of Glasgow and Edinburgh to the quaint Scottish Highlands and local villages like Fort William, visit everything from tranquil lochs and mountains to bustling cities and beautiful beaches in Scotland. Travelling by coach is a wonderful way to explore Scotland, as you're able to see so much of its beautiful landscape en-route. Shearings offer a wide range of Scottish tours, so whether you’re looking for a relaxing holiday or a more adventurous coach tour they’re sure to have something to suit your needs, you can even enjoy tours from expert guides who’ll show you the very best places to visit including Ben Nevis, The Jacobite, Steall Waterfall and the Commando Memorial. Are children allowed on Coach holidays? Yes - Children of all ages are welcome abroad a coach holiday with Shearing Holidays. However, the only exception is if the holiday is specifically designated as 'Adult Only'. Children between the after of 2 and 11 years may travel at a discounted rate when accompanied by an adult and infants under 2 are free of charge. Seating arrangements can be discussed at time of booking. What is the deposit and when is my balance due? Deposits vary depending on which holiday you have booked. This information will be given to you at the time of booking. If you're unsure, you can call a customer representative. On a Shearings coach holiday, you can take one medium sized suitcase per person (20kg/40lb). Shearings reserve the right to refuse any luggage which exceeds the limit or you may be asked to remove any excess weight. You may also take a small holdall bag on board the coach. Shearings Holidays offer a wide range of award winning coach holidays, escorted tours, holidays by air, European river cruises and self drive hotel breaks to suit everyone's taste. Why not use our Shearings Holidays Voucher Codes to save even more money on your next holiday booking? With a huge range of European Destinations to choose from you can be sure to find the perfect holiday for you and all the family. Shearings have over 100 years’ experience in planning great value holidays and cover everything from rail holidays, singles holidays, coach tours all with expertly planned itineraries from a wide range of pick up points. We are constantly on the hunt for Voucher Codes for Shearings Holidays to help you with your money saving. Our experts check dozens of sites for secret codes including NHS discounts, student sites & social media channels saving you time & money!